Modern high-tech drones, professionally referred to as UAVs, enable the efficient capturing of three-dimensional, digital surface data. With our drones, we are able to generate high-precision 3D volume models (3D meshes), measurements, terrain models and orthomosaic photos (orthophotos) on inaccessible terrain in the shortest possible time without having to interrupt ongoing operations in the process. Volume calculation and quantity surveying with drones is no longer a fantasy of the future. By using drones for quantity surveying, the safety of all persons and staff involved is increased. Personnel and survey engineers no longer have to enter dangerous areas, such as cliff edges, slopes or public roads. We supply the data or documentation in the required format to your office and staff can go about their work out of harm’s way. Afterwards, the type of material, density and tonnage can be determined based on our quantity survey and an orthomosaic photo, for example. The data is also used for calculations and especially follow-up calculations during or after the completion of a project. Up-to-date and regular measurement data also plays an ever bigger role in the management of resources, the allocation of storage space and the determining of excavation and filling volumes; e.g. in large earthworks projects. 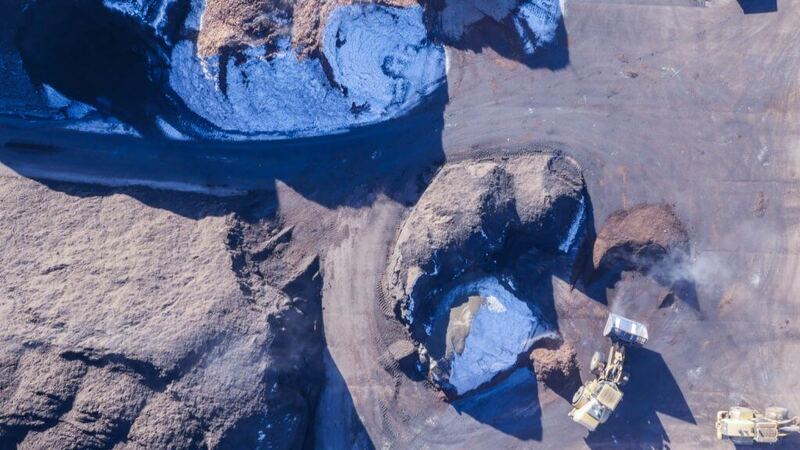 When surveying stockpiles or three-dimensionally scanning landfills, quarries and bulk material, we can document the exact actual condition on day X. We can use the data captured during the UAV flight for volume calculation and quantity surveying in order to generate a DTM (digital terrain model), which can then be compared with the previous DTM. For big projects, quarries or landfills, flying over terrain at regular intervals is useful for supplying software (e.g. ERP systems) or project management (e.g. for BIM applications) with constantly updated data. This makes regular target/actual comparisons possible, which help with inspections, regular calculations and follow-up calculations. There is nothing to stop the data being used for working with forecasted billing quantities. Most calculation and accounting programs can handle forecasted billing quantities). Every company is obligated in different ways to supply regular documentation to state institutions – primarily the revenue service. This also applies to landfills, stockpiles and quarries which have to document raw material extraction, stock/material turnover, consumption and sales in order to determine the associated values and to bill for them accordingly. The use of UAVs in this respect is unbeatably efficient and cost-effective when compared with conventional methods, and that’s before taking accuracy into account. We guarantee and document the accuracy discussed beforehand – for what good to you are the low prices of our competitors or the procurement of a consumer drone when you have to capture the data yourself, you do not get the desired result at the end, you have to go looking for errors and you have unwittingly messed up your surveying? You have to be able to trust your data. That is why it is important to have gathering/measurement performed by professionals with calibrated top-of-the-range drones. You can save yourself from having to write off thousands of euros, having to iron out inconsistencies in end-of-the-quarter figures or from getting control-related problems. Biomass products, such as wood, wood chips, tree trunks, paper, pulp, mulch, bark mulch, compost and manure. Minerals, such as stone (gravel, grit, shingle, rocks, etc. ), gypsum, coal, sodium silicate, calcium, clay. Road construction materials, such as asphalt, coke, cement and concrete. Recycling materials, such as waste paper, recycled gravel, recycled shingle, compost, trash, plastics, mixed materials from building sites and residual waste. Difficulties only arise in principle when the materials are extremely thin, wiry and are thus delicate or the materials move. The scanning of water of fluids is only possible under certain conditions and with special equipment. In addition to volume calculations, the visualisation of material stocks, storage locations, extraction sites and their changes frequently plays a big role in planning and implementation. With weekly, monthly or quarterly drone flights, following consultation, our customers receive always up-to-date 3D models, 3D views, 2D orthomosaic photos (true-to-scale and distortion-free images) in the agreed format for their project teams or office staff. From the second task you already have a visual history which you can compare with the latest excavations, material movements or construction progress. In the same manner, you can visually illustrate the services you have provided to your customers, partners and investors, etc. Have we aroused your interest? We would be delighted to advise you or provide you directly with a non-binding offer upon request for volume calculation and quantity surveying using our drones and experienced pilots.